Again it is prophecy that is our theme (see last week). Here, we concentrate on the sending of prophets, the entrusting of the mission to them, and most importantly the neces­sary qualifications to be a prophet. The only qualification necessary is an open ear, to hear the mandate from God. We see this in Amos, the simple shepherd, and in the Twelve, called by Jesus from their humble occupations, which no one would have thought qualified them to speak on ‘religious’ themes. As last week, the possibility of rejection and failure is quite explicitly treated ‑ Jesus instructs the Apostles in what to do if they are ignored. 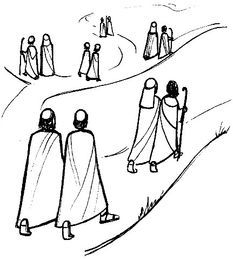 When the Gospel simply states, “So they set off to preach repentance...” we can imagine all that was in their minds and hearts as they did so. They had heard the call of Jesus, and allowed it into their hearts: this was all they needed to go out and speak his words. Here we see prophecy and ‘organised religion’ coming into conflict: the priest of Bethel rejects Amos, and tells him to clear off. But Amos replies that he cannot cease doing what he has begun, because it was not his choice or his career: the Lord is responsible for his mission, and he cannot ignore that call. Be careful with the change in speaker half way through: it's clear on the page, but how are the congregation to know that someone else is speaking when Amaziah has finished? Emphasise the words of the Lord, as he sends Amos out on his mission. This is one of the most densely packed readings we find: a tremendous hymn of praise of God's eternal plan to save his people. Given the complexity of the reading, it may be advisable to concentrate on the shorter version ‑ but still read the longer one yourself. The first line gives the context: “Blessed be God...”: this is an outburst of praise by Paul. Remember this throughout the reading. The reading is printed in the Lec­tionary in sense‑lines, which are there to help you read: this is more poetry than anything else, and so demands a slightly more flexible way of reading: look for an use the natural tone or colour of words such as: “holy and spotless”, “kind”, “praise”, “free gift”, “freedom”, “richness”, “showered”, “mystery”, “kindly”. You must take this reading slowly, allowing pauses for ideas (not words) to settle into the minds of those listening. Given the length of the sentences (especially the second) people are not go­ing to be following this as they would a story. It is more important to paint pictures and drop ideas ‑ Paul is using language to create a mosaic of God's loving plan of our being “chosen in Christ”. If you read the longer version, save a special emphasis for the words “Now you too...” since this is addressed to your con­gregation this morning or evening. "He began to send them out." 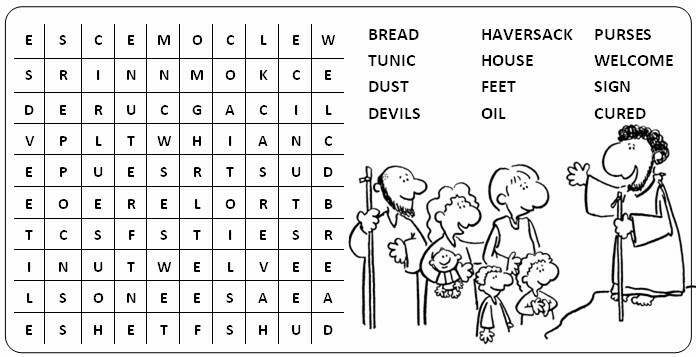 Click here to get this Sunday Wordsearch. Feel free to copy and paste it into your parish publications.